Abardeen » Blog » Period Homes » Period homes that have been re-roofed from slate to tiles? Should these tile re-roofs now be replaced with slate ? Over the years, it was common for many owners of old Victorian and Edwardian period homes to try to improve or modernize their homes. In Melbourne this was really popular during the 60’s, 70’s and even into the 80’s. Period homes in this era saw many of their traditional and original features altered or removed completely. This was especially so if it could be seen from the front of the home. Features such as double hung sash windows, solid panel front doors and surrounds, verandahs’, ornate chimney removals. One of the most common improvements seen was the removal of the original slate roof and the installation of terracotta or concrete roof tiles. It’s hard to know these days if there were problems with the original slate roof which caused the change over to the tile roofing. There would have been roofing slate in the 60’s to 80’s that would have been wearing out and causing problems that’s for sure. I’m also certain that slate available for roofing in Melbourne during this time was very limited. Slate roofs didn’t really start making a comeback from the 1920,s until the late 1970’s so availability and choice was limited. This slate was also of a very poor quality from my observations over the years. We’re not saying this practice of re-roofing from slate to tiles was right or wrong but in most instances it was done for purely aesthetic reasons. The weight of the terracotta and concrete tiles occasionally caused problems for the lighter roof structure required for slate. This can sometimes be seen today with sagging and bowed roof surfaces caused by the rafters and ridges giving in a little to the added weight. A weight that they were never really designed to carry. Fast forward to the last five to ten years and homeowners are realising that their period homes are much better suited to their original roof coverings. You only need to look at Victorian period homes around Melbourne with tiles and compare them to the ones with slate. The tiles appear much ” chunkier ” than the much more sleeker and more suited profile of the slates. From a period homes resale point of view, houses that have the original type of roof covering are usually much more sought after and command higher sale prices than the non original ones. If you’ve got a home that originally had a slate roof and now has tiles the choice is yours really what to do. Easy choice I suppose if the tiles are old and needing replacement … not so easy if they’re still serviceable. There’s no doubt the slated period homes just look so much better. They not only look and function better, but the value and resale value of the home is substantially increased. If you’re considering replacing a roof for slate, or need assistance or advice regarding what type of slate roof your period home may have had originally, we’re happy to help you. 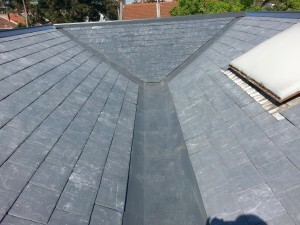 We provide our slate roof services to all suburbs of Melbourne. Here’s a few pics of a recently completed project of ours in North Melbourne. The home originally had Bangor blue slate roof tiles as pieces of the originals were found in the ceiling spaces. The terracotta roof tiles were installed around 1964 [ dated underside of tiles ].With our advice the owners chose Welsh blue slates, a very close match to the originals. The same home re-roofed with Welsh roofing slates.